A few days ago, I stopped in at the Santos Flower & Fruit stand to grab some fresh papayas and apple bananas. 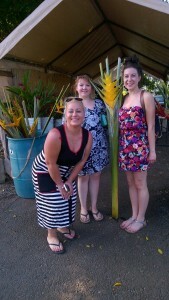 These girls couldn’t BELIEVE the size of our flowers and asked me to snap their photo. Yes, that yellow heliconia is taller than any of them. They told me they were ‘florists from Florida’, and a single stem like this would cost close to $50 on the Mainland! Wow! My back yard, therefore, is full of treasures! There are hundreds of different species of heliconia – this is one of the largest. You can pop one in a tall floor vase and it will stay looking gorgeous for two weeks! Previous post: When is a banana not a banana? When it’s an ORCHID BANANA! Need specific dates? Prices? Just ask!